Area: 9.9 million sq. km. (3.8 million sq. mi. ); second-largest country in the world. Cities: Capital--Ottawa (pop. 1.1 million). Other major cities--Toronto (4.7 million), Montreal (3.4 million), Vancouver (2.0 million). Terrain: Mostly plains with mountains in the west and lowlands in the southeast. Population (2005 estimate): 32.4 million. Ethnic groups: British/Irish 28%, French 23%, other European 15%, Asian/Arab/African 6%, indigenous Amerindian 2%, mixed background 26%. Religions: Roman Catholic 44.4%, Protestant 29%, other Christian 4.2%, Muslim 2%, other 4%. Education: Literacy--99% of population aged 15 and over has at least a ninth-grade education. Health: Infant mortality rate--5.2/1,000. Life expectancy--77.1 yrs. male, 82.2 yrs. female. Work force (2005, 16.3 million): Goods-producing sector: 25%, of which: manufacturing 15%; construction 6%; agriculture 2%; natural resources 2%; utilities 1%. Service-producing sector: 75%, of which: trade 16%; health care and social assistance 11%; educational services 7%, accommodation and food services 7%; professional, scientific, and technical services 7%; finance 6%; public administration 5%; transportation and warehousing 5%; information, culture, and recreation 5%; other services 4%. Constitution: The amended British North America Act of 1867 patriated to Canada on April 17, 1982, Charter of Rights and Freedoms, and unwritten custom. Branches: Executive--Queen Elizabeth II (head of state represented by a governor general), prime minister (head of government), cabinet. Legislative--bicameral parliament (308-member House of Commons; 105-seat Senate). Judicial--Supreme Court. Federal-level political parties: Liberal Party, Conservative Party of Canada, Bloc Quebecois, New Democratic Party. Subdivisions: 10 provinces, 3 territories. Nominal GDP (2005): $1.077 trillion. Real GDP growth rate (2005): 2.8%. Nominal per capita GDP (2005): $32,800. Natural resources: Petroleum and natural gas, hydroelectric power, metals and minerals, fish, forests, wildlife, abundant fresh water. Agriculture: Products--wheat, livestock and meat, feed grains, oil seeds, dairy products, tobacco, fruits, vegetables. Industry: Types--motor vehicles and parts, machinery and equipment, aircraft and components, other diversified manufacturing, fish and forest products, processed and unprocessed minerals. Trade: Merchandise exports (2005, FOB basis)--$364.8 billion: crude petroleum and products, natural gas, motor vehicles and spare parts, lumber, wood pulp and newsprint, crude and fabricated metals, wheat. In 2005 85% of Canadian exports went to the United States. Merchandise imports (2005, FOB basis)--$317.7 billion: motor vehicles and parts, industrial machinery, crude petroleum, chemicals, agricultural machinery. In 2005, 59% of Canadian imports came from the United States. The relationship between the United States and Canada is probably the closest and most extensive in the world. It is reflected in the staggering volume of bilateral trade--the equivalent of $1.2 billion a day in goods, services, and investment income--and people, more than 200 million crossings of the U.S.-Canadian border every year. In fields ranging from law enforcement cooperation to environmental cooperation to free trade, the two countries work closely on multiple levels from federal to local. In addition to their close bilateral ties, Canada and the U.S. work closely through multilateral fora. Canada--a charter signatory to the United Nations and the North Atlantic Treaty Organization (NATO)--takes an active role in the United Nations, including peacekeeping operations, and participates in the Organization for Security and Cooperation in Europe (OSCE). Canada joined the Organization of American States (OAS) in 1990 and hosted the OAS General Assembly in Windsor in June 2000, and the third Summit of the Americas in Quebec City in April 2001. Canada seeks to expand its ties to Pacific Rim economies through membership in the Asia-Pacific Economic Cooperation forum (APEC), and will host the winter Olympic Games in Vancouver-Whistler, British Columbia in 2010. Although Canada views good relations with the U.S. as crucial to a wide range of interests, it occasionally pursues independent policies at odds with the United States. In 2003, Canada did not participate in the U.S.-led military coalition that liberated Iraq (although it has contributed financially to Iraq�s reconstruction). Other examples are Canada�s leadership in the creation of and on-going support for the UN-created International Criminal Court (ICC) for war crimes--which the U.S. opposes due to fundamental flaws in the treaty that leave the ICC vulnerable to exploitation and politically motivated prosecutions--and Canada�s decision in early 2005 not to participate directly in the U.S. missile defense program. The United States and Canada also differ on the issue of landmines. Canada is a strong proponent of the Ottawa Convention, which bans the use of anti-personnel mines. The United States, while the world�s leading supporter of demining initiatives, declined to sign the treaty due to unmet concerns regarding the protection of its forces and allies, particularly those serving on the Korean Peninsula, as well as the lack of exemptions for mixed munitions. U.S. defense arrangements with Canada are more extensive than with any other country. The Permanent Joint Board on Defense, established in 1940, provides policy-level consultation on bilateral defense matters and the United States and Canada share NATO mutual security commitments. In addition, U.S. and Canadian military forces have cooperated since 1958 on continental air defense within the framework of the North American Aerospace Defense Command (NORAD). The military response to the terrorist attacks of September 11, 2001 both tested and strengthened military cooperation between the United States and Canada. In December 2002, the two countries established a Binational Planning Group to develop joint plans for maritime and land defense and for military support to civil authorities in times of emergency. Since 2002, Canada has participated in joint military actions in Afghanistan. Canadian Forces led the NATO International Stabilization Force (ISAF V) there for half of 2004, and in the summer of 2005, Canada deployed a 250-member Provincial Reconstruction Team in Kandahar. It is planning for the deployment of a 1,000-person battle group in early 2006. Canada has also contributed to stabilization efforts in Haiti, including by deploying over 500 Canadian troops. The U.S. and Canada also work closely to resolve transboundary environmental issues, an area of increasing importance in the bilateral relationship. A principal instrument of this cooperation is the International Joint Commission (IJC), established as part of the Boundary Waters Treaty of 1909 to resolve differences and promote international cooperation on boundary waters. The Great Lakes Water Quality Agreement of 1972 is another historic example of joint cooperation in controlling transboundary water pollution. The two governments also consult semiannually on transboundary air pollution. Under the Air Quality Agreement of 1991, both countries have made substantial progress in coordinating and implementing their acid rain control programs and signed an annex on ground level ozone in 2000. In June 2003, Canada and the U.S. announced a new border air quality initiative designed to increase cooperation in combating cross-border air pollution, including particulate matter. Three regional projects have been selected for initial joint action. Canada ratified the Kyoto Accord at the end of 2002, despite concern among business groups and others that compliance would place Canada�s economy at a lasting competitive disadvantage vis-�-vis the United States. Canada�s federal government has committed about U.S. $8 billion over seven years to achieving greenhouse gas emission reductions, plus modest additional funds for research and long-term technology development. Canada participates in the U.S.-led International Carbon Sequestration Leadership Forum, which researches effective ways to capture and store carbon dioxide. Canada is also a founding member of the International Partnership for the Hydrogen Economy and the Global Earth Observation System of Systems, both of which are designed to address climate change and are supported by the U.S. In early 2005, Canada joined the U.S.-led Methane to Markets initiative, which focuses on transferring technology to developing countries for the capture and use of methane from pipelines, landfills and other sources. In late 2005, Canada hosted the United Nations Climate Change Conference in Montreal. While law enforcement cooperation and coordination were excellent prior to the terrorist attacks on the United States of September 11, they have since become even closer through such mechanisms as the Cross Border Crime Forum. Canada, like the United States, has strengthened its laws and realigned resources to fight terrorism. U.S.-Canada bilateral and multilateral cooperation in the fight is exemplary. Canada is a significant source for the United States of marijuana, as well as precursor chemicals and over-the-counter drugs that are used to produce illicit synthetic drugs. Implementation and strengthening of 2003 regulations in Canada and increased U.S.-Canadian law enforcement cooperation have had a substantial impact in reducing trafficking of precursor chemicals and synthetic drugs, but cannabis cultivation, because of its profitability and relatively low risk of penalty, remains a thriving industry. Canada is a major aid donor and targets its annual assistance of nearly $3 billion toward priority sectors such as good governance; health (including HIV/AIDS; basic education; private-sector development; and environmental sustainability. The United States and Canada enjoy an economic partnership unique in the world. The two nations share the world�s largest and most comprehensive trading relationship, which supports millions of jobs in each country. In 2005, total merchandise trade between the two countries (FOB basis) was $483 billion, translating into over $1.2 billion in goods crossing the border every day. The two-way trade that crosses the Ambassador Bridge between Michigan and Ontario equals all U.S. exports to Japan. Canada's importance to the United States is not just a border-state phenomenon: Canada is the leading export market for 39 of the 50 U.S. States, and ranked in the top three for another 8 States. In fact, Canada is a larger market for U.S. goods than all 25 countries of the European Community combined, whose population is more than 15 times that of Canada. The comprehensive U.S.-Canada Free Trade Agreement (FTA), which went into effect in 1989, was superseded by the North American Free Trade Agreement among the United States, Canada and Mexico (NAFTA) in 1994. NAFTA, which embraces the 406 million people of the three North American countries, expanded upon FTA commitments to move toward reducing trade barriers and establishing agreed upon trade rules. It has also resolved long-standing bilateral irritants and liberalized rules in several areas, including agriculture, services, energy, financial services, investment, and government procurement. Since the implementation of NAFTA in 1994, total two-way merchandise trade between the United States and Canada has more than doubled, creating many new challenges for the bilateral relationship. The Security and Prosperity Partnership, launched by all three NAFTA countries in March 2005, represents an effort to address these challenges on a continental basis. Canada is an urban services-dependent economy with a large manufacturing base. Since Canada is the largest export market for most states, the U.S.-Canada border is extremely important to the well-being and livelihood of millions of Americans. The U.S. is Canada's leading agricultural market, taking nearly one-third of all food exports. However, imports of Canadian livestock products, particularly ruminants, fell drastically after the discovery of a single case of bovine spongiform encephalopathy (BSE, mad cow disease) in spring 2003. Shipments of most Canadian beef to the U.S. were resumed in late 2003 and trade in live cattle under 30 months resumed in July 2005. Conversely, Canada is the second-largest U.S. agricultural market (after Japan), primarily importing fresh fruits and vegetables and livestock products. The U.S. and Canada enjoy the largest energy trade relationship in the world. Canada is the single largest foreign supplier of energy to the United States--providing 17% of U.S. oil imports and 18% of U.S. natural gas demand. Recognition of the commercial viability of Canada�s oil sands has raised Canada�s proven petroleum reserves to 180 billion barrels, making it the world�s second-largest holder of reserves after Saudi Arabia. The electricity grids of the United States and Canada are closely linked and meet jointly developed reliability standards. Quebec is a major source of electricity for New England. While 98% of U.S.-Canada trade flows smoothly, there are frequent bilateral trade disputes over the remaining 2%. Usually, however, these issues are managed through bilateral consultative forums or referral to World Trade Organization (WTO) or NAFTA dispute resolution procedures. For example, in response to WTO challenges by the United States, the U.S. and Canadian Governments negotiated an agreement on magazines that will provide increased access for the U.S. publishing industry to the Canadian market, and Canada amended its patent laws to extend patent protection to 20 years. Canada currently has a number of challenges pending in NAFTA and WTO dispute settlement mechanisms related to U.S. trade remedy law, including actions taken by the U.S. Government on softwood lumber. The U.S. and Canada resolved a WTO dispute over dairy products in 2003. The United States and Canada also have resolved several major issues involving fisheries. By common agreement, the two countries submitted a Gulf of Maine boundary dispute to the International Court of Justice in 1981; both accepted the Court's October 12, 1984 ruling that delineated much of the boundary between the two countries� Exclusive Economic Zones (EEZs). The United States and Canada signed a Pacific Salmon Agreement in June 1999 that settled differences over implementation of the 1985 Pacific Salmon Treaty. In 2001, the two countries reached agreement on Yukon River Salmon, implementing a new abundance-based resource management regime and effectively realizing coordinated management over all West Coast salmon fisheries. The United States and Canada recently reached agreement on sharing another transboundary marine resource, Pacific Hake. The two countries also have a treaty on the joint management of Albacore Tuna in the Pacific, and closely cooperate on a range of bilateral fisheries issues and international high seas governance initiatives. In 1995, the United States and Canada signed a liberalized aviation agreement, and air traffic between the two countries has increased dramatically as a result. U.S. immigration and customs inspectors provide preclearance services at seven airports in Canada, allowing air travelers direct connections in the United States, and preclearance operations are expected to begin in Halifax soon. The two countries also share in operation of the St. Lawrence Seaway, connecting the Great Lakes to the Atlantic Ocean. Canada and the U.S. have one of the world�s largest investment relationships. The U.S. is Canada's largest foreign investor. Statistics Canada reports that at the end of 2004, the stock of U.S. foreign direct investment in Canada was $175 billion, or about 65% of total foreign direct investment in Canada. U.S. investment is primarily in Canada's mining and smelting industries, petroleum, chemicals, the manufacture of machinery and transportation equipment, and finance. Canada is the seventh-largest foreign investor in the United States. At the end of 2004, the U.S. Commerce Department estimates that Canadian investment in the United States, including investments from Canadian holding companies in the Netherlands, was $134 billion at historical cost basis. Canadian investment in the United States is concentrated in manufacturing, wholesale trade, real estate, petroleum, finance, and insurance and other services. The U.S. Embassy in Canada is located at 490 Sussex Drive, Ottawa, Ontario. The mailing address is P.O. Box 866, Station B, Ottawa, Ontario, K1P 5T1 (tel. 613-238-5335). Canada is a constitutional monarchy with a federal system, a parliamentary government, and strong democratic traditions. The 1982 Charter of Rights and Freedoms guarantees basic rights in many areas. Queen Elizabeth II, as Queen of Canada, serves as a symbol of the nation's unity. She appoints a governor general, who serves as her representative in Canada, on the advice of the prime minister of Canada, usually for a 5-year term. The prime minister is the leader of the political party in power and is the head of the cabinet. The cabinet remains in office as long as it retains majority support in the House of Commons on major issues. Canada's parliament consists of an elected House of Commons and an appointed Senate. Legislative power rests with the 308-member Commons, which is elected for a period not to exceed 5 years. The prime minister may ask the governor general to dissolve parliament and call new elections at any time during that period. Vacancies in the 105-member Senate, whose members serve until the age of 75, are filled by the governor general on the advice of the prime minister. Recent constitutional initiatives have sought unsuccessfully to strengthen the Senate by making it elective and assigning it a greater regional representational role. Each province is governed by a premier and a single, elected legislative chamber. A lieutenant-governor appointed by the governor general represents the Crown in each province. Canada maintains an embassy in the United States at 501 Pennsylvania Avenue, NW, Washington, DC 20001 (tel. 202-682-1740). On February 6, 2006, Stephen Harper was sworn in as Canada�s twenty-second Prime Minister, succeeding Liberal Party leader Paul Martin. An admitted "policy specialist," Harper rose from the ranks of conservative political party staffers. Prior to becoming Prime Minister, he sat as a Member of Parliament, including as Leader of the Opposition since 2002 when he became head of the western-based Canadian Alliance. He was elected the first leader of the Conservative Party of Canada when it was created in 2003 through the merger of Canadian Alliance and Peter MacKay�s Progressive Conservative Party. The January 23, 2006 election victory by the Conservative Party ended twelve years of Liberal Party rule that, in the end, was tainted by corruption and ethics concerns, despite the economic progress Canada achieved while the Liberals were in power. In the January 2006 elections, the Conservatives made unexpected gains in Quebec, winning ten seats. Many observers have noted how a reinvigorated Conservative option in Quebec represents a boost for national unity. Harper�s government is in a minority position in the House of Commons, however, and has a slimmer minority than was enjoyed by the preceding Liberal government. The Conservatives now hold 125 seats and the Liberals 102. The separatist Bloc Quebecois (BQ) has a majority (51) of Quebec�s 75 seats (the BQ offers candidates only in Quebec). The left-leaning New Democratic Party (NDP) increased its seat count to 29, but fell short of the number that would have guaranteed it the power broker role it played in the previous Liberal minority government. Prime Minister Harper�s Conservatives began the 39th Parliament in the spring of 2006 with several objectives that were featured during the later election campaign: accountability and ethics in government; cutting the federal value-added sales tax; measures to fight crime and urban violence; reducing wait times for medical procedures in Canada�s national health system; and providing a tax credit to parents for young children�s day care. Harper�s Cabinet choices on February 6 included his Quebec advisor and campaign co-chair Michael Fortier, who was appointed to the Senate and given the portfolio for the Department of Public Works and Government Services, and former Liberal Industry minister David Emerson, who crossed the floor immediately after the election to become the Conservative Government�s Minister of International Trade. Former Deputy Opposition leader Peter MacKay was named Foreign Minister. In Canada's political system, a key challenge for any federal government is balancing the conflicting interests of Canada�s 10 provinces and 3 territories. Recognizing the advantages of a coordinated approach in dealing with the federal government, the provinces and territories created a Council of the Federation in 2003, with their leaders (Canada�s premiers) meeting regularly in that forum to develop common positions. Quebec, which represents 23% of the national population (and has a similar proportion of seats in the House of Commons), seeks to preserve its distinctive francophone nature, and is perceived by the less-populous western provinces as wielding undue influence on the Federal Government. At least until January 2006�s election of Albertan Stephen Harper as Prime Minister, the western provinces had sometimes expressed concern that their interests were not fully attended to by Ottawa. Ontario, for its part, believes that it pays out significantly more to the Federal Government than it gets back in revenues; and the Atlantic provinces seek to assert greater control over fishing and mineral rights off their shores. 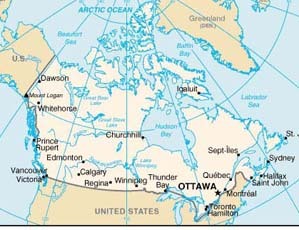 The Federal Government, which had been led by the Liberal Party from 1993 until February 2006, has ceded some power in a few areas of provincial jurisdiction, while seeking to strengthen the federal role in many other areas such as inter-provincial trade and the regulation of securities. Former Prime Minister Martin�s minority government made significant concessions to the provinces, including a revenue sharing agreement with the Atlantic provinces over offshore energy earnings, and a revenue transfer agreement with Ontario. In the September 2004 First Minister�s conference, Martin made a CN$41 billion health care transfer deal to the provinces. This included a separate deal for Quebec that came to be seen as reinforcing "asymmetric federalism," a view that accepts that not all provinces must be treated the same by the Federal Government to be treated equitably. Prior to the health agreement, reduced federal support to the provinces for health care services had been a major point of contention between provincial leaders and the previous Liberal governments, as it was perceived to have contributed to sustained fiscal deficits in many provinces while the Federal Government ran sustained surpluses (the so-called "vertical fiscal imbalance"). The election in April 2003 of Premier Jean Charest and the Liberal Party of Quebec to govern Canada�s second most populous province was a significant victory for the federal government, which over the years has struggled, under the threat of secession, to accommodate the aspirations of the French-speaking province. Though for now most Quebec voters seem to appreciate the economic benefits of remaining in the confederation and prefer seeking to advance their separate francophone identity with that confederation, 47% of Quebec voters still identify themselves as desiring "sovereignty," although the precise meaning of the term in a Quebec context remains ambiguous. Anger over the "sponsorship" program has reignited talk of sovereignty and increased support for the separatist Bloc Quebecois and Parti Quebecois, while seriously damaging support for provincial Liberals. However, it is too early to predict how this will play out in the next Quebec provincial election, not likely to be held before 2007 or 2008.